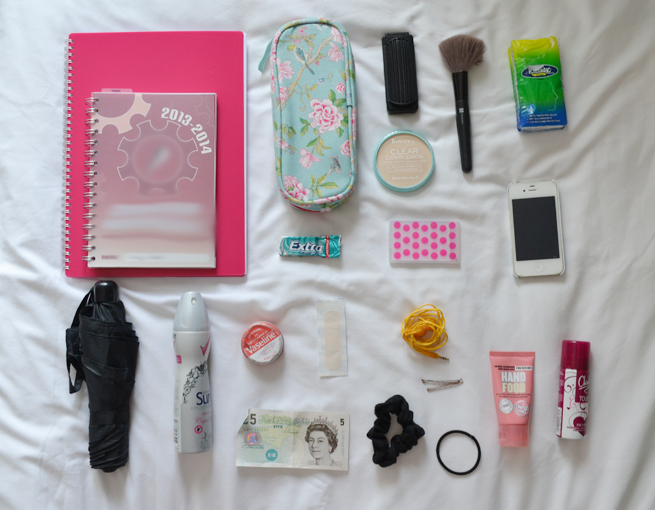 As you probably know, on Thursday I started Sixth Form and just before my holidays ended I stocked up with everything a woman would ever need in their bag. 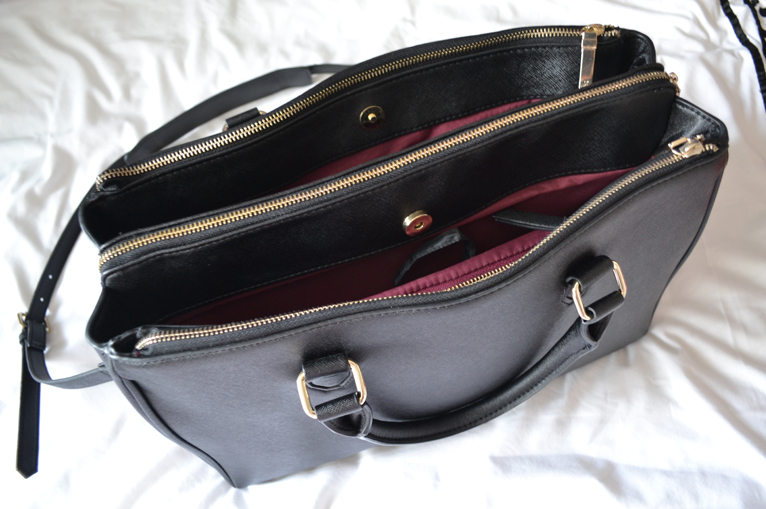 I’ve been dying to use my Zara Office City bag that my mum bought for me back in March, but seeing as I only had a few weeks left of High School it seemed pointless. 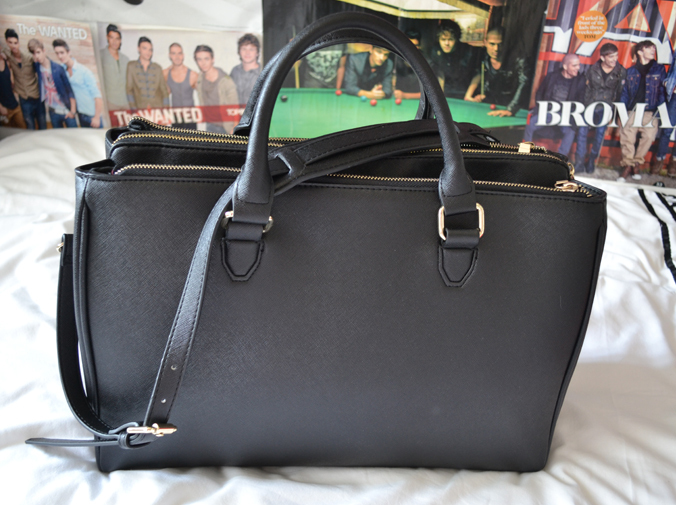 And you always have to start a new year with a new bag! I struggled with what to call this post as it can be used for pretty much anything – work, high school, college, you name it! This hairbrush is one I’ve had for years which I bought from Claires. A hairbrush will always be useful, especially if, like me, you’re going to be going from school work to gym work and need to chuck your hair up. I like to think this is pretty obvious – you never know when you’re going to need to top up your make-up or be told you’ve got something on your face! I’m always getting dry hands so it’s always handy to have some hand cream in my bag. Last year I also had some Anti-Bacterial Gel, particularly for when I was going to eat, it’s horrible to think of all the surfaces you’ve touched and all the germs that could be lurking on them! Smelling bad is possibly the worst thing that can happen, so I like to keep a deodrant in my bag which will be especially useful when I use the gym and some body spray, just to top up my fragrances or if I forget to put any perfume on one morning! I’m always applying vaseline to my lips, I’ve actually had this tin for years and it’s my challenge to empty it. Always handy for when you get dry lips! I’m forever getting oily skin so I like to keep some powder in my bag just to dust over my face halfway through the day and mattify my face. Especially useful for the winter months – sniffing is a pet hate of mine! Sixth form means own clothes which means I can be wearing a different pair of shoes every day – chances are I will get a blister at least once! English weather is very unpredictable!! I very often have a hair mishap so having an extra hairband and slides are always handy. I rarely need money as I bring my own lunch to school, but it’s nice just to have a little for reassurance in case you forget one day or need to buy a drink etc. Let’s be honest, is it even possible to leave the house without your phone? Tangled, of course. I’m a massive music person and will always find some time to plug these in and have a little jam. When it comes to Sixth Form, it’s a lot different to High School and you’re expected to provide yourself with your own books etc. I started off with a new A4 notepad to jot down any notes, but I’m also on the hunt for some folders for each subject to keep everything in one place – it’s better to be organised! Another pretty obvious one, you need pens to write with. I think it’s very important to have a Diary, it’s the key to being organised! Luckily my sixth form supply me with one but if you don’t, definitely make it a priority to get one! I like to write in all my homework in and when it’s due in so I don’t forget. I like to think I’m the Mary Poppins of our time, packing pretty much everything into one tiny bag.